The federal government has reached an agreement with the government of Nauru to settle asylum seekers on the tiny Pacific island nation. In a deal similar to the one struck with Papua New Guinea last month, Prime Minister Kevin Rudd on Saturday signed a memorandum of understanding with Nauruan President Baron Waqa that will see the 21 square kilometre Pacific nation, home to about 10,000 inhabitants, process and settle asylum seekers. As part of the deal, Nauru will receive $29.9 million in aid and an additional $17 million to refurbish the nation’s prison, which is severely overcrowded following last month’s riots on the island. Those riots at the island’s detention centre left a damage bill estimated at about $60 million. Nauru President Baron Waqa said asylum seekers were not just a problem for Australia. ‘‘It is a regional solution for us as well and we’ve happily engaged ourselves right from the start with the original Pacific solution and nothing has changed,’’ he said. 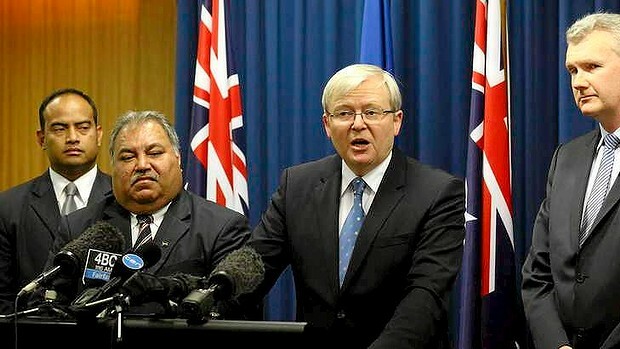 Mr Rudd conceded Nauru was a small nation and may not be able to settle many asylum seekers. ‘‘Therefore, the numbers that would be settled to reside in Nauru would be entirely at the discretion of the government of Nauru,’’ he said. ‘‘But this agreement today is an agreement that, for the future, this is legally possible between us and therefore its implementation, case by case, numbers by numbers, will be a matter for our friends in Nauru and we’ll work together closely on that. Mr Rudd described the Nauru deal as ‘‘one extra pillar’’ in the government’s campaign to stop people smuggling in the region. ‘‘As I’ve said explicitly up front, Nauru is a small country but this agreement enables some to be settled there and adds to the agreement with Papua New Guinea,’’ he said. The signing of the deal in Brisbane came a day after it was revealed the government's PNG policy would cost $1.1 billion.